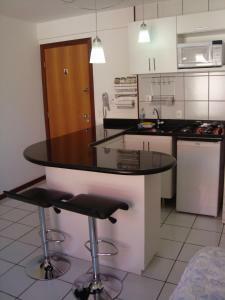 Located in Brasília, Flat BSB Comfort 05 offers a fitness centre and free Wi-Fi. The self-catering accommodation is only 800 metres from Bosque Sudoeste park. The apartment provides a flat-screen TV, air conditioning and a minibar. There is a full kitchenette with a microwave and kitchenware. Featuring a shower, the private bathroom also comes with towels. At Flat BSB Comfort there is a terrace. Other facilities like a shared lounge are offered. Within 200 metres of the property are bars, restaurants and stores. The apartment is 1,2 km from City Park and 3,9 km from Caixa Cultural Center. Presidente Juscelino Kubitschek Airport is located 12 km from the property. The property offers free parking.